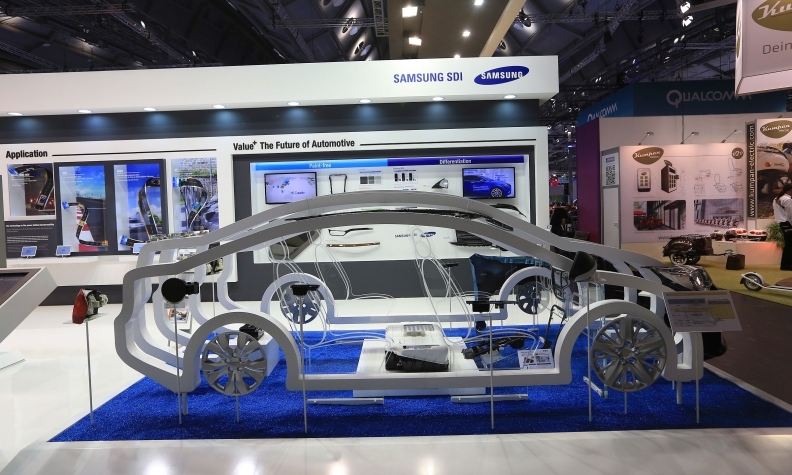 A car-shaped installation at the Samsung SDI automobile battery display at the Frankfurt Motor Show in September. SEOUL -- Samsung Electronics and group companies are making a belated push into the business of supplying technology to carmakers, while rivals are already lining up lucrative deals with an industry that is notoriously difficult to enter. Data compiled by Thomson Reuters IP & Science shows the world's top smartphone maker and other Samsung Group tech affiliates are ramping up r&d for auto technology, with two-thirds of their combined 1,804 U.S. patent filings related to electric vehicles and electric components for cars coming since 2010. The analysis did not include filings made after 2013 due to a lag between filing and publication. They haven't yet landed significant business, and Samsung Group declined to comment on strategy, but the lure is obvious. Automakers already incorporate or are developing technologies to enhance safety and provide better smartphone connectivity and entertainment systems, creating an opening for tech companies to break into a market for software, services and components that is worth around $500 billion, ABI Research analyst Dominique Bonte said. "There are two trends: the car becomes a connected software device, and the entire mobile and ICT ecosystem is getting very interested in playing a part in that evolution," Bonte said. That is particularly welcome as demand for smartphones, TVs and computers slows, but Samsung is arriving late at a party where some of the best partners are already taken. Cross-town rival LG Electronics Inc announced a major supply agreement with General Motors in October, sending LG's shares surging, while U.S. chipmaker Nvidia Corp., known for graphics processors that power games consoles and laptops, says its chips will be in more than 30 million cars in the next three to four years. Unlike Apple and Google, there is no clear sign yet that Samsung is developing its own autonomous driving technology. IHS analyst Danny Kim said Samsung Group does not yet have a unified, group-wide approach to building its supplier presence in the industry. "Samsung needs a serious commitment to drive the synergies between all competent organisations within Samsung Group," he said. A decade after selling its debt-laden carmaking unit to Renault, Samsung Group in 2010 announced its second foray into the auto industry, identifying car batteries as one of its five growth businesses. Its Samsung SDI Co. is now the world's No. 6 electric car battery maker, counting BMW, Chrysler and Volkswagen among its clients. Other parts of the Samsung empire are now in the hunt. Samsung patent filings show a wide range of technologies including a drowsy-driving detection system, an alert system for break-in attempts and a transparent display for directions and traffic information. Samsung Electro-Mechanics Co. recently formed a dedicated team to sell components such as camera modules to new automotive clients and says it would consider acquisitions to boost car-related businesses. Samsung Display has also cited the auto industry as a potential growth area and has been testing its organic light-emitting diode displays with BMW and auto parts maker Continental. The growth prospects are mouthwatering. Nvidia says its autos revenue was $148 million for the first half of this fiscal year, nearly doubling in a year. Consulting firm McKinsey said in a 2014 report that revenue from hardware, software and services for connectivity-enabled cars could grow to $200 billion (180 billion euros) by 2020 from an estimated 30 billion euros in 2014. Carmakers may spend an additional $6,500 per car when they launch fully autonomous vehicles, the Boston Consulting Group said in a report this year. Analysts say the supply relationships built by SDI could be expanded by bundling parts and services from other Samsung arms. Samsung insiders acknowledge, however, that it may take several years before tech arms other than Samsung SDI generate significant auto-related sales. Product development cycles in the auto industry are far longer than in consumer electronics, and carmakers are cautious about adding suppliers without a track record. It took the better part of a decade for Nvidia to gain acceptance as a global supplier, while LG worked with GM for nearly a decade before it got its supply contract for the Chevrolet Bolt EV. Samsung Electronics could still catch up by taking the one-stop-shop approach, similar to that of LG Electronics, by working with sister companies to combine offerings such as batteries, chips, sensors and software such as the Tizen operating system into a single package, analysts say. ABI's Bonte said Samsung could also speed things up by acquiring established players such as Japan's Renesas Electronics Corp., which researcher Gartner says was the world's top auto semiconductor maker last year, with $3.1 billion in revenue. "It's important for a supplier to be able to sell not just one single component but provide that entire platform," he said.